Sometimes it takes me a long time to get around to listening to a CD, often for a combination of reasons. Of course, there is a lot of music out there, and never enough time to take it all in right away. Other times, I may have simply grown tired or weary of a band, and thus I continue to put off giving a new release from said band a true chance. 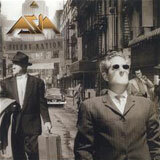 Such is the case with Asia’s final album with vocalist John Payne, Silent Nation. To my ears, Aqua (1992) was a very strong “comeback” for the band with John Payne replacing original vocalist John Wetton behind the mic. There are some hard rocking tunes on that album, with some guitar work that actually borders on metal territory. The classic, lush keyboards and the melodic quality of the band are still present on Aqua as well. However, something happened after Aqua; the band gradually dropped its energy and rock roots from its sound (particularly after Aria). For me, the music tedious to listen to, and completely lacking in urgency. Over the years, I simply lost interest in the band after later albums simply did nothing for me. So, when Silent Nation was released a few years ago, I didn’t give it much thought. I just seemed to always be busy with life, and with other music. With the recent reunion of the four original members of the band, and the release of a new album, Phoenix, I decided to revisit this album. I had heard good things about Silent Nation, despite my overlooking the album for a long time. So I decided it was time for me to finally give this album some time. Obviously, the band was looking for a fresh start with this album. For the first time ever, the album title does not start and end with an “A,” and it is more than one word. Lost is the largely punchless and much too laid back keyboard based sound of the past couple albums, and we are treated to a straight forward melodic rock album that borrows from the rock roots of the band’s past. Upon the opening seconds of What About Love, I notice right away that the rock guitars are finally back. The keyboards have shifted to more of a supporting role, and we therefore have some bona fide hard rock on our hands. While there are a couple of songs with a deeper Asia style progressive feel, Silent Nation is much more of a traditional melodic rock album that much of what we have heard from the band before. As I said before, the keyboards definitely serve more of a supporting role here as opposed to being a dominant force as in the past. Still, the album does have its traditional Asia style progressive touches. What About Love, Long Way From Home, and the prog rocker Midnight get the album going in a straight ahead, upbeat way. This is the sort of sound the immediately drew me to Aqua years ago. Geoffrey Downes’ keyboard and orgran layers provide a nice accompaniment to the songs and help to accentuate the melodies, but they do not overpower the songs whatsoever. Blue Moon Monday clocks in at over 7 minutes, and it is one of the tracks that will please fans of the more progressive side of Asia. The keyboards are more of a driving force here, and the emotions and temp vary throughout. The overall vibe is a bit dark by Asia standards, with the choruses very forceful and urgent. The title track continues on with this darker and moody vibe, although we’re back to a straight forward rocker this time. Ghost in the Mirror follows, and it is another rocker. Instead, the mood lightens up a lot, reminding me very much of The Who. Gone Too Far is an emotional ballad that features some nice guitar soloing throughout. Appropriately, I Will Be There For You is a hard hitting rocker that shifts gears quite nicely after the previous song. A nice melody, a great hook, and a fast pace throughout are just what is needed at this spot in the album. Darkest Day is another dark, more prog rock leaning tune that features some more emotional vocals from John Payne and some haunting keys from Downes. The Prophet closes the album, and the band chose to go with a mellow and subtle finish. The song seems to be slowly building, but ultimately lets down as it wanders aimlessly for about five minutes without creating any excitement. It’s a dull finish to an otherwise energetic and interesting album. Silent Nation marks the end of the John Payne era of Asia. The band really fires on all cylinders on this album, making it a great way for this lineup of the band to go out. I hope that this group of musicians will work together again in the future as the Payne / Downes team is clearly capable of writing some fantastic songs. However, as I currently absorb the latest Asia album, Phoenix, I realize that the band will be served well by this reunion.